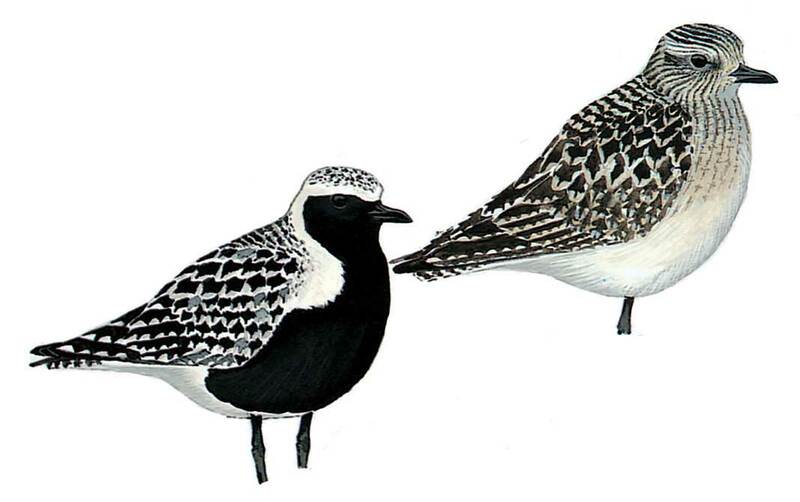 Large, rather robust-looking plover, bigger than European Golden, with heavier head and longer, stouter bill; lacks obvious yellow or greenish tones in upper-parts, except for faint yellow-buff tinge in juvenile. Black axillaries diagnostic in all plumages in flight (most obvious and contrasting in juvenile and non-breeding). Adult breeding recalls European Golden, but more white on head and nape, larger white breast-side patch, coarsely speckled black and white upperparts, and lacks white flank-line. Non-breeding and winter similar to European Golden, but distinguished by size, structure, and mainly greyish appearance. Wing-beats distinctly slower with longer, slimmer wings than in European Golden; note also obvious white wing-bar and white rump. Behaviour like European Golden but more coastal.